Rich Brian (formerly known as Rich Chigga) has turned his virality into stone-cold hype for his debut project, Amen, which released today (Feb. 2). 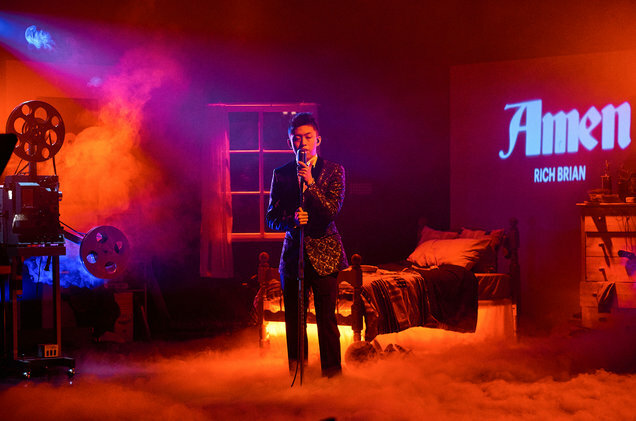 In promotion of the album, the Indonesian-born rapper paid a visit to The Late Late Show With James Corden to play a brooding medley of “Amen” and “Cold” both of which are on the album. Alone on the dark stage which flashed between blue and red lights, It was Brian and the mic, as the online sensation spit rapid fire bars over an eerie synth as a vintage film projector streamed “AMEN Rich Brian” In bold blue letters across the wall behind him.